Thread: Big Stitch Quilters- I Need Help! I'm finishing up that Blazing Star that Craftsy offered when I got a year membership. I have not enjoyed this quilt at all but as I finish up I realize I don't want to spend mega bucks to have it quilted and my skills aren't up to anything that large (98x98). The pattern was challenging( Y seams and partial Y seams) but I totally goofed up the Lone Star part of it. I'm just not inclined to redo it. No way! So....... I thought of big stitch quilting. I don't want to do my usual hand quilting as I don't like it enough to put in all that work. MSQC has some nice perle cotton in variegated shades that would be awesome I think. So my question- do you think big stitch would work for this monster? Any help is greatly appreciated. good for you for stretching your skills!! I don't know how hot it gets where you are, but I took a 100X110 top, pieced together a back and quilted it with no batt. without batt it fit through the machine with no bother at all. Quicker done, quicker usable Looks beautiful on the bed. I'll trust your judgment that there are problems with the quilt, but from here it looks spectacular. If it weren't already completely pieced, I would suggest quilting it in sections. You could still do that using the method where you divide the batting into thirds. I haven't used that method, so I can't give all the directions, but it's explained in Marti Michell's book Machine Quilting in Sections. You can probably find it online too. I do think the big stitch would look great on that quilt, but I don't have experience with that either. Big stitch reminds me of sashiko, and I did have a class in that and enjoyed it very much. My other suggestion is to wait a week or two and see if your feelings about the quilt change. You may find that you like it a lot better when you've had time to forget where the oopsies are. I have a lonestar kit from Craftsy too (not the same one) and am dreading starting it. The directions aren't for strip piecing, but for cutting and sewing individual diamonds from templates. Sheesh! I'll have to try to figure out how to bring the pattern into the modern world. Big stitches are so satisfying. I've done the pearle cotton with my tiny big stitch and it looks awesome. So if that is a look you want, I would definitely say 'go for it'! I think you will get frustrated with 'big stitching'. As a hand quilter ( as well as machine), l find it difficult to get big stitches looking even. Plus with the heavier thread, you can only do a few per needle, as it's difficult to pull through. If it were me, l'd baste, stitch in the ditch by machine, and call it done. The piecing looks fine from any distance. I just finished doing my first big stitch quilting and found that the process is much more "organic" than traditional quilting. Keeping the stitches even and the same on top and bottom is not necessary. I enjoyed the process and will be doing it again. After I was 90% through the quilting, I discovered a Clover Gold Eye Millner needle#5 was perfect. It was very sharp and easy to work with. I was using Aurifil 12 wt, so the small eye worked fine. Have fun - it's a beautiful quilt and you will be so much happier with it when you have completed it. First, your top is beautiful! I big stitch 90% of my quilts, so I say go for it! I would use Perle #8, not 5 as #8 is a little smaller and easier to pull through the 3 layers. (May be why some have had issues) I also use 12wt thread by Aurifil or Sulky. Variegated threads are fun to work with. I use Thimblelady XL needles or chenille needles. My stitches are 4-6 per inch, so aren't huge and I have no problems making them even. They look good on the back as well, but that comes with practice. Machine quilting to me is harder and more frustrating as I try to wrestle a big quilt through a small machine. I can big stitch a quilt fairly quickly if I spend some time on it every day and it's a simple pattern. Can you give it away as a top? Let someone else who likes it finish it. I'd probably let it sit for yrs and then give it away. Another idea. It might pass as a Mennonite quilt. There's a store in Kingsburg that quilts tops and has a sale in April. Susie, I think it's beautiful and I think after time, once the memory of how hard it was has faded, you will see it too. I know that's how it is for me. I use 12 wt thread and a long (4") sashiko needle. I love the look, and i goes real fast. BTW, I love your lone star, and my eagle eye can't see any problems with this beautiful quilt. Well, you had better sleep a day or two and then look at your beautiful quilt again. When that quilt is quilted, you will want to keep it for yourself. Thanks to all who replied. The more I look at it the more I think it will turn out okay. I'm pretty sure I'm going to big stitch it. I ordered the variegated Perle cotton from Missouri Star. 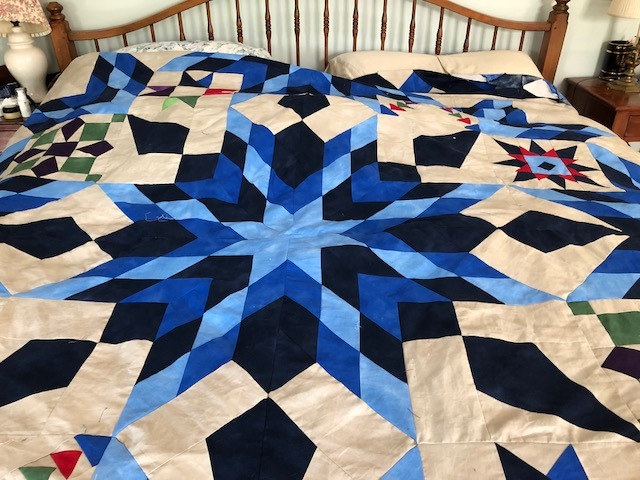 My Dad still uses a quilt my Mom’s Mom made without batting (grandma passed away in 1972!). He calls it a summer quilt. SusieQ that is one gorgeous quilt and would certainly look fine with the big stitch. BTW, I have that headboard, so if you don't like it when finished it would look great on my bed! I think big stitch will be wonderful on this gorgeous quilt! I want to learn Big Stitch quilting, as I find I can no longer handle a quilt to machine quilt. I appreciate knowing that there is an interest in this. I appreciate all of the help. Faintly Artistc, your encouragement was most helpful. If I have problems and/or questions, may I PM you? My Lone Star still sits unfinished in its box. I have hope that some day I will be brave enough to pull it out and fix it. Yours looks great - not sure what the problems are but I know from experience what a bugger this pattern is. I think big stitches would look great. My color choice would be a variegated blue. I bet you will like it better when it's finished. grandma7- Youtube has some nice tutorials on big stitch quilting. it doesn't look hard at all, especially if you are familiar with hand quilting. The color sequence in my lone star is goofed up but I kind of like the pattern that emerged from my mistake! SusieQOH, thank you for the encouragement. I've put together some sample quilt sandwiches to practice on. I made a pinwheel quilt (from my bucket list) and want to use the big stitch on it. grandma7- everything I've seen and read says that it's not so important that the stitches are the same. It's more of a "relaxed" method. We can do it!!! It's a very pretty quilt. Nice work! Since you are a regular hand quilter I thing the big stitch will aggravate you. We work so long to make nice small stitches and then when it comes time for big stitch it is very difficult to go big. I did one and didn't enjoy the process. I might suggest you tie it instead with matching threads. If you don't like to see the threads hanging you can bury them inside the quilt. Grandma7, you are welcome. Feel free to pm me if you'd like. I will post pics when I am on my computer. My favorite big stitch videos on YouTube are Jo Glover's. She is very thorough and does beautiful work.